Last night, Jay Z and Beyoncé started their own rumor — a pregnancy rumor. 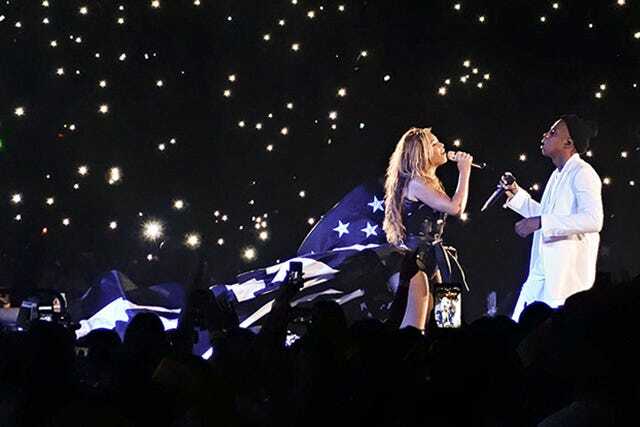 During their final performance together at the Paris show of their On The Run tour, Jay Z reportedly switched up the lyrics to "Beach Is Better," rapping "Cause' she pregnant with another one." Could it be true? Could the power couple be expecting another power baby? Or, is it just that you can only confirm your happy marriage via Instagram so many times before you have to take to song? Given that Bey has certainly perfected the art of the reveal, this could very well be the couple's way of saying the world is about to get a lot more Jay and Bey. But, we can't ignore the fact that the divorce rumors that plagued the couple in July began after Beyoncé changed the lyrics to her song, "Resentment," to hint at possible infidelity. So, while this could be their way of way of saying, "We control the message, we control the rumors, we control the world," it could also be their version of the old ultrasound on Facebook. Or, maybe it's both?